$645.00 M 1943 service tunic of a Corps of Engineers or Quartermaster Corps Major General, circa late 1940s to mid 1950s. Buttons are the 1948-1956 sixteen republic version. Size about a US 40. $340.00 Walking-out dress tunic for Army (Land Forces) Major General, circa late 1960s-early 70s. In very good condition. $470.00 Army (Land Forces) Lieutenant General walking-out dress uniform, late 1970s. Includes gray tunic and navy blue straight leg trousers. The tunic has eight rows of ribbons for decorations including an Order of Alexander Nevsky, Order of the Red Banner, a number of WW2 campaign medals (Polar Region, Moscow, Berlin, Prague) and an unusually large number of foreign awards. A truly spectacular set in XL size and in superb condition. $360.00 Colonel General Service Uniform, Soviet Army Land Forces, early 1980s. Complete with red striped breeches. Large size, about a US 46L. A well preserved uniform of a very high ranking Soviet general. $420.00 Winter Greatcoat for an Army Colonel General, circa 1960s. In gray wool, double-breasted with red piping. Extremely well- tailored piece in generous XL size. Very well-tailored and substantial garment made to insulate the owner in Russian winter. In very good to excellent condition. $875.00 M 1968 Air Force Major General full dress uniform, 1968- early 1970s. Includes Tunic and Breeches in Extra Large size. 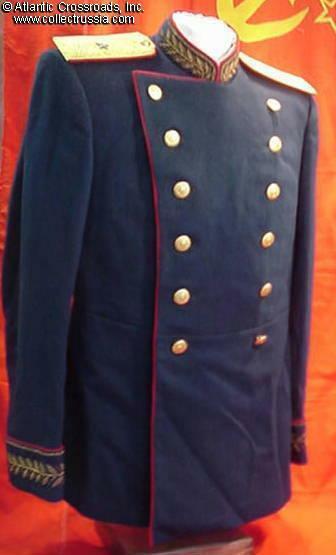 A classic early example of the dress uniform worn by the top command of the Soviet Air Forces until the breakup of the Soviet Union. $430.00 M 1972 Air Force major general's field uniform, 1970s. This very distinctive combat uniform was used only for a short period, in 1972 - 1987. Medium / Large size. In excellent condition. Very hard to find with Air Force piping. $145.00 Light greatcoat (Raincoat) for Major General, as worn with service uniform, circa 1970s-80s. Large / Extra Large size. In very good condition. $780.00 M 1943 Winter Greatcoat for Air Force Major General, circa late 1940s - early 50s. Comes complete with M-43 dress shoulder boards in gold. XL size. A spectacular uniform in excellent condition. $290.00 Service tunic of a Naval Air Force Major General, late 1960s - early 70s. Large size, about a US 44. In very good to excellent condition. $350.00 Walking-out dress kitel tunic for Medical Corps Major General, circa late 1970s - early 80s. Judging by the ribbon bars, the original owner not only participated in WW2, but also remained on active duty in the military for a long time, at least through the mid-70s. A very uncommon uniform of a high ranking Soviet medical officer. Medium / Large size. In very good condition. $190.00 General's straight leg trousers for walking-out dress uniform, circa 1960s-70s. Dark blue version used only until 1980 (with the light gray walking-out tunic). Hard to find very tall / XL size, in outstanding condition. $1,400.00 Tunic and Vest of an Ambassador Extraordinary and Plenipotentiary of the USSR (highest Soviet diplomatic rank), circa 1955. This extremely rare uniform is of magnificent quality and in superb condition. $180.00 Gold brocade belt for a full dress General uniform, dated 1979. In excellent condition. $50.00 Overcoat and Raincoat collar tabs for Generals, c 1970s-1980s. Excellent condition. $290.00 Administrative Lieutenant General sew-on Dress shoulder boards, 1960s. Silver embroidery with gold bullion stars. Silver brocade indicated an administrative officer, perhaps medical, veterinary, or legal. In most of those branches, lieutenant general was probably the highest rank attainable. $105.00 Air Force Lieutenant General sew-on Service shoulder boards for the overcoat, c 1960s. Subdued gray embroidery with gold bullion stars for the overcoat. Blue piping. $95.00 Lieutenant General sew-on Service shoulder boards, c 1960s. Subdued embroidery with gold embroidered stars. Style used for overcoats, office wear. $95.00 Lieutenant General slip-on Service shoulder boards, c 1960s. Subdued embroidery with gold embroidered stars. Style used for raincoats. $95.00 Lieutenant General slip-on Service shoulder boards, 1960s-1970s. Subdued embroidery with subdued OD embroidered stars. Style used for raincoats. $20.00 Lieutenant General, slip-on shoulder boards for the green shirt, 1960s-70s. Green linen with gold tracery and bullion stars. $220.00 Air Force Major General M1943 slip-on "field" shoulder boards, 1943-mid1950s. Silk embroidery with silver bullion stars. Blue piping. $240.00 Administrative Major General slip-on Dress shoulder boards, late 1950s through 1960s. Silver embroidery with gold bullion stars. Silver brocade indicated an administrative general, perhaps quartermaster, medical, veterinary, or legal. $95.00 Air Force Major General Service sew-on shoulder boards for the overcoat, 1960s-1970s. Subdued gray embroidery with gold bullion stars. Blue piping. $140.00 Air Force Lieutenant General (2-star general) Sew-on Dress Shoulder Boards, circa 1970s-80s. In near mint condition. $80.00 Major General sew-on Dress shoulder boards, c 1970s. Gold brocade. Tailor modified and subsequently removed from a tunic. $85.00 Major General sew-on Service shoulder boards, 1960s-1970s. $50.00 Major General sew-on Field shoulder boards, 1960s-1970s. Subdued OD embroidery with OD embroidered stars. $14.00 Major General, slip-on shoulder boards for the green shirt, 1960s-70s. Green linen with gold tracery and bullion stars. $29.00 Major General, slip-on shoulder boards for the white dress shirt, 1980s. White linen with gold tracery and bullion stars. $10.00 Button for a General's or Marshal's tunic, 1940s. Scarce WW2 style with 11 republics in the Soviet State emblem. In very good to excellent condition. $5.00 Button for a General's or Marshal's tunic, dated 1963. Excellent condition. $3.00 Button for a Navy Admiral's tunic, 23.5 mm wide, dated 1976. Early model with brass backing. In excellent condition. $2.00 Button for a Navy Admiral's tunic, 23 mm wide, dated 1981. In excellent condition. $95.00 General's boots, c 1950s-60s. In fine quality black leather, white leather lining. Size 42. Field worn condition but still very sound and good for display. $90.00 General's field boots in a very sturdy black leather with a partial white leather lining. Size 42 (about a US size 8.5 - 9), perfect for displaying with a field uniform. Used but in very good condition. C 1950s-70s.